Modern medical experts explain the "blood and water" to actually be separated hemoglobin and plasma, the two major constituents of whole blood, which separate after death. And being in an agony he prayed more earnestly: and his sweat became as great drops of blood falling down to the ground. 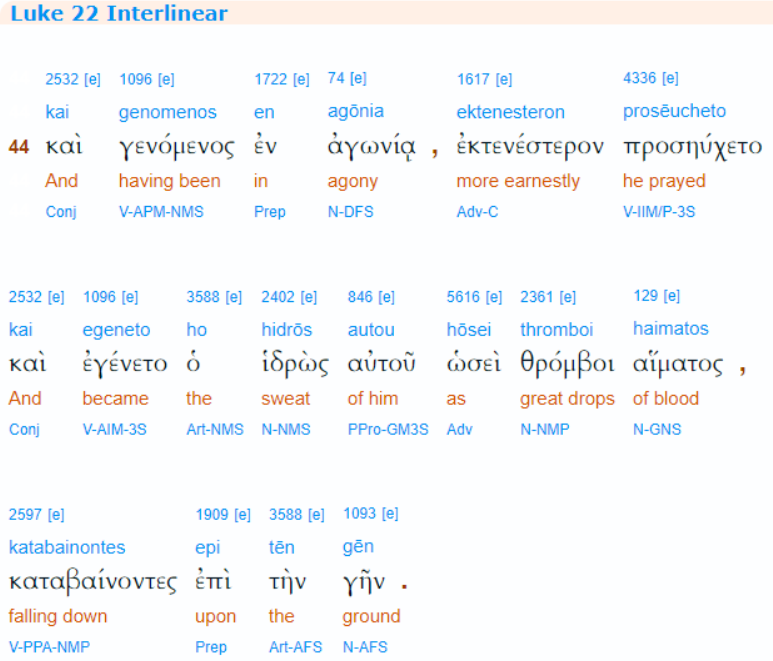 Key words: "egeneto ho hidros ... haimotos" - "became the sweat ... blood" in the Interlinear. So the question is in the title: Could Jesus have sweated actual blood in the garden of Gethsemane? Yes. Modern medical knowledge confirms the condition and the cause reported by the physician Luke using the word egeneto to describe how sweat became blood. Hematohidrosis is a very rare condition in which an individual sweats blood. It may occur in an individual who is suffering from extreme levels of stress. Various causative factors have been suggested like component of systemic disease, vicarious menstruation, excessive exertion, psychogenic, and unknown causes. Fear and intense mental contemplation are the most frequent causes. Taken in context it is clear he was certainly in "intense mental contemplation." Written by the physician Luke, "egeneto ho hidros ... hiamotos" - "became the sweat...blood"
Is it correct to conclude that what is described in Luke 22:44 is a case of the medical phenomenon called hematidrosis ( bloody sweat)? As is mentioned in @Nigel J comment the verse is drawing a comparison of how Jesus had sweat that dropped like blood. It is describing the action of the dripping sweat not saying that the sweat was tinged with blood or had some coloration like blood. Certainly a stretch to say the verse is indicative of Jesus' sweat containing certain fractional components found in the chemical make up of blood. Jesus in Gethsemane. Concerning Jesus Christ when in Gethsemane on the final night of his earthly life, Luke 22:44 states: “But getting into an agony he continued praying more earnestly; and his sweat became as drops of blood falling to the ground.” The writer does not say that Jesus’ sweat was actually mingled with his blood. He may only have been drawing a comparison, perhaps indicating that Christ’s perspiration formed like drops of blood or describing how the dripping of Jesus’ sweat resembled a drop-by-drop flowing of blood from a wound. On the other hand, Jesus’ blood may have exuded through his skin, being mixed with his sweat. Bloody sweat has reportedly occurred in certain cases of extreme mental stress. Blood or elements thereof will seep through unruptured walls of blood vessels in a condition called diapedesis, and in hematidrosis there is an excreting of perspiration tinged with blood pigment or blood, or of bodily fluid mingled with blood, thus resulting in the ‘sweating of blood.’ These, of course, are only suggestions as to what possibly took place in Jesus’ case. Not the answer you're looking for? 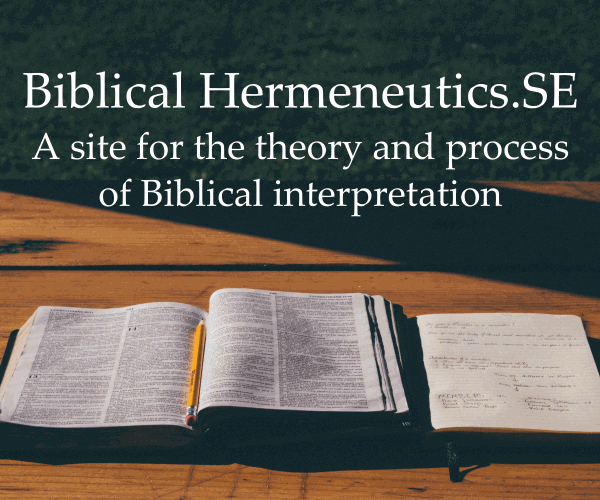 Browse other questions tagged exegesis gospel-of-luke or ask your own question. When Christ was pierced with the spear, why did water come out? Is there any significance to naming Lazarus in this parable? What is the significance of water from Jesus' side? Why the change of heart for Peter in John 18? Does God have a form as seen by John the Apostle?